Band Saw Chip Brushes remove chips from the bandsaw blade and prevent debris from being "pulled" back into the cut. This will prevent the blade from cutting a “heat treated” Chip. 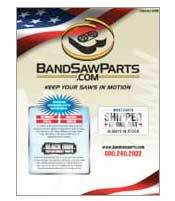 A chip bush can extend the life of your band saw blade by 20%. It is often forgotten or neglected on a band saw but is one one most important items on a band saw. A properly adjusted chip brush is vital to cutting rates as well as the blade life. Two pack of 80 mm diameter crimped wire wheel brushes with a 20mm Arbor and an 16mm thickness. Sold as a pack of two brushes.